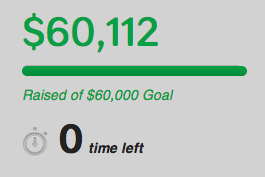 Late last night (Friday March 1, 2013), The Forge met its fundraising goal of 60,000 dollars right as the clock ran out on their campaign. You’ll remember from my past blog posts that the fundraiser was launched in conjunction with the 2012 Halloween party, which gave some much needed momentum to the campaign from the get-go, and our friends at Indiegogo generously allowed for two 30-day extensions of the fundraiser so there was enough time to meet our goal. If you haven’t read the rest of my thoughts on why Indiegogo is an incredible tool, you should. Corduroy was funded and still currently operates with The Forge as its home and headquarters, so we’re excited to see them reach their goal — which obviously isn’t enough to upgrade overnight to being a fully operational recording or production studio, but its at least a solid start and helps provide equipment and gear that the studio needs to keep growing and improving. Collins Schude and Scott Chrisman made the below “What Is The Forge” videos as the campaign winded down to help tell the story and evolution of the building, and the video above was shot at the Forge (all three shot and edited by Scott Chrisman), capturing a week of shoots and events the place offered to artists with no rental fees.